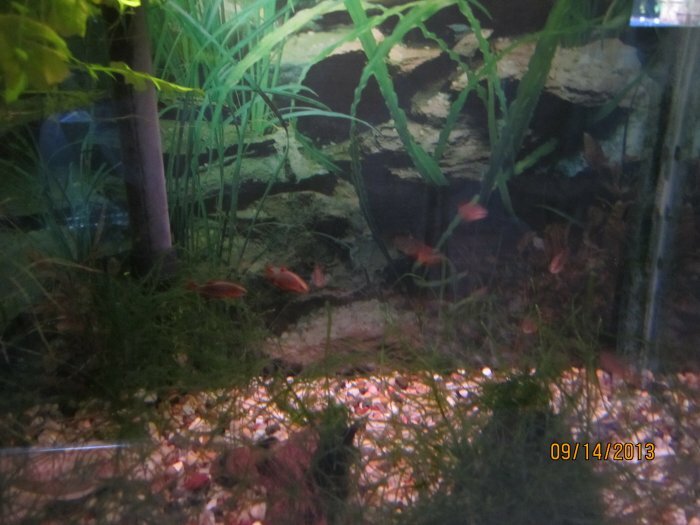 On 5/23/12, I got four celestial pearl danios from Live Aquaria. They were in a dark blue solution. I drip acclimated them and then netted them in to my 20 gallon tank. One was barely moving. Later in the day, I saw three of them schooling. I think one is probably dying or already dead. The tank is so heavily planted that I cannot see everywhere. The fish are very small. You have to look hard but, when you do, they are gorgeous fish. The next morning, three of the danios were schooling together. The other one must have died. Two of the danios were displaying similarly to what my male white cloud mountain minnows have done. They were more intense in color than the third danio. Despite their tiny size, I think I have one female and two males who already want to spawn! There was some chasing as well of the males after the female. 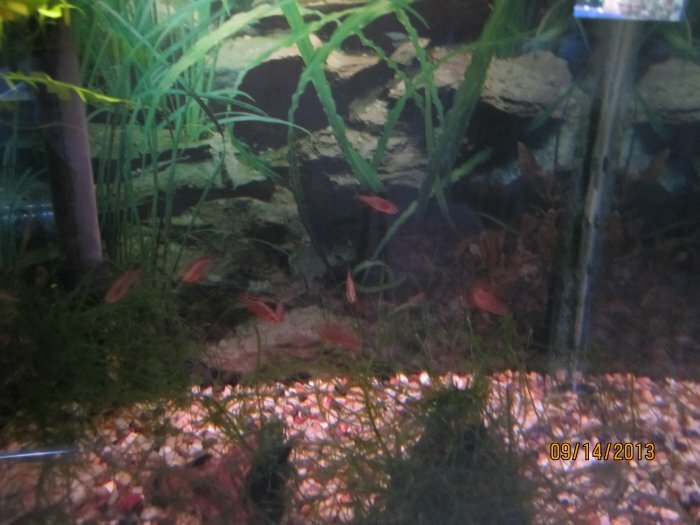 Some time in early July, 2012, one of the celestial pearl danios must have vanished because now (7/21/12), I only see a pair (one male and one female) that are usually in the same spot when I am near the tank. One must have died. As of 8/21/12, the pair are alive but have not grown since I got them or done much of anything to report. 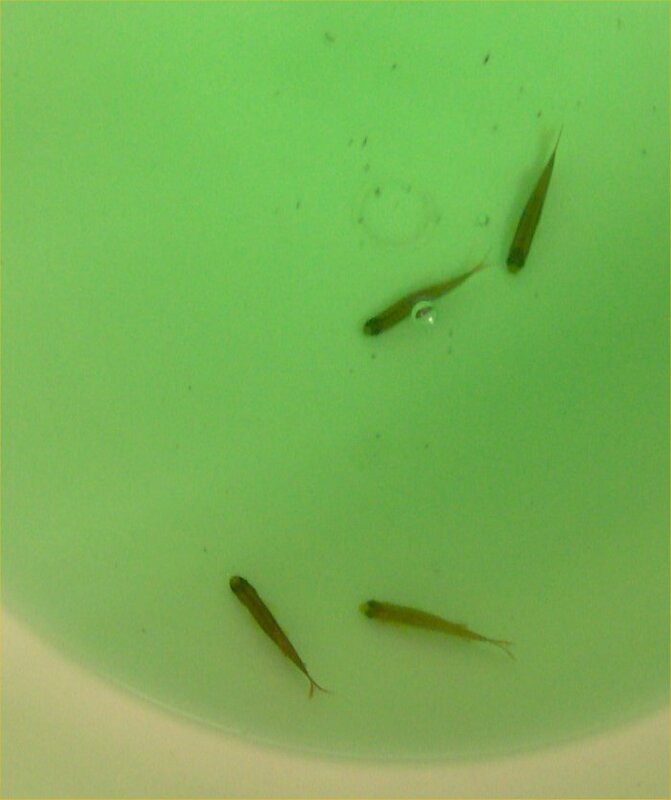 On 11/24/12, I was surprised to find two newborn fry in the drained water from the 20 gallon tank. I drain the tanks in to the bathtub so I can rescue any fry. I rinse it out between tanks. 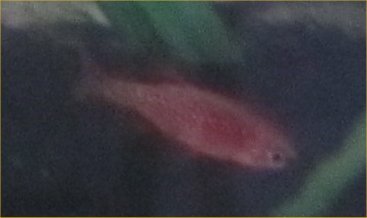 The only other species of fish that I have in the tank (aside from a solitary female bristlenose pleco) are panda cories which have fry that large and tadpole-like (I have seen dozens of those in my life). These two fry were small, smaller than zebra danio fry, more like paradise fish fry size. They must be celestial pearl danios! I put the two babies in a net breeder in the 20 gallon tank and hope they can beat the odds and grow. I put in another baby that was hanging on the tank glass after dark on 11/29/12. When I cleaned the tank on 11/30/12, I saw two babies swimming about. I was unable to catch them so I lowered the net breeder when I changed the water and brought it back up once I put water back in. 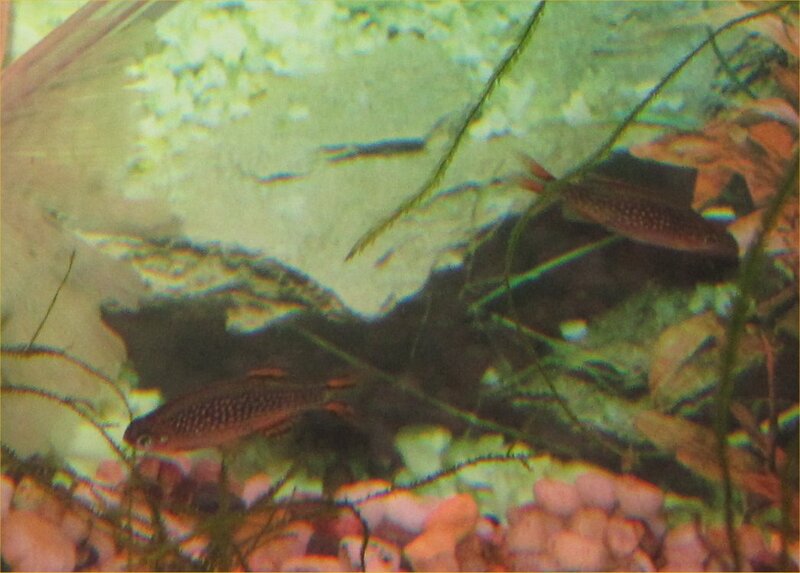 On 12/21/12, while looking in the 20 gallon tank, I was shocked to find two baby danios swimming around! They are slightly bigger than the two survivors in the net breeder. The babies made it on their own due to the high amount of plant cover. So, I now have at least 6 celestial pearl danios. 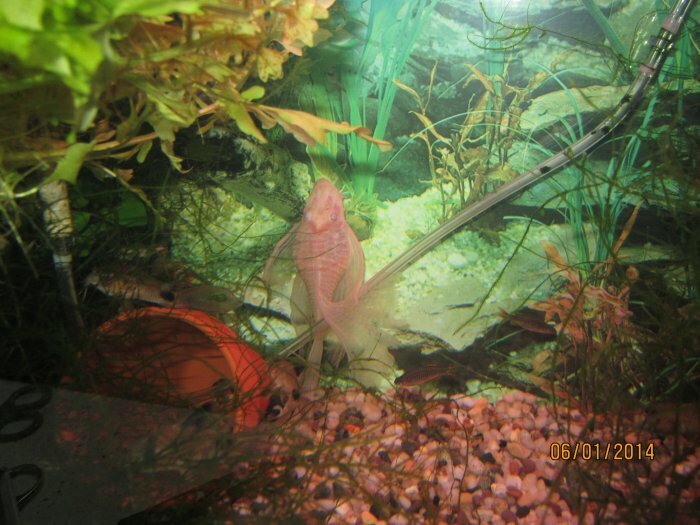 I released the two in the net breeder on 12/29/12 after the weekly water change. The four babies are doing well. On 1/18/13, I saw a new little baby joining the other four babies! The largest of the four babies has full adult colors now but is maybe half the size of his/her parents. They grew up fast. On 2/9/13, I saw not only the parents and five babies but now two more little ones. There is quite the school now. By early March, those extra little ones have not been seen. The five babies and two parents are getting close to all being the same size now. By 3/13/13, most of the babies are as big as the parents; they are less than four months old. That is fast growth compared to other fish I have had. 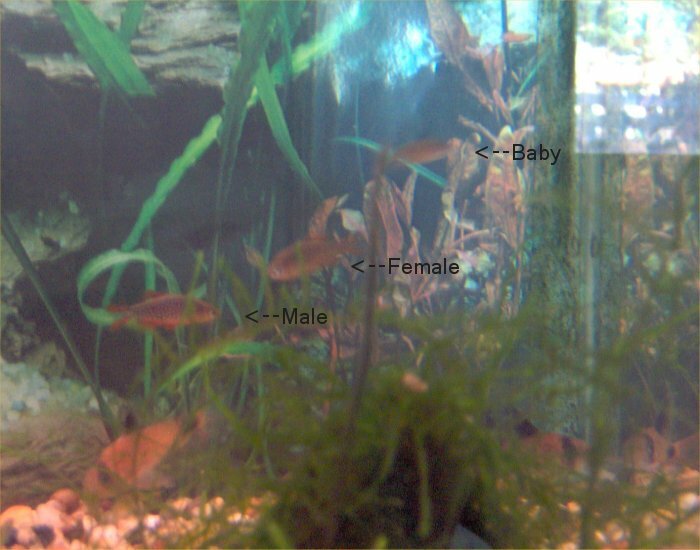 By 7/6/13, there are at least nine celestial pearl danios of adult size. On 4/2/16, I counted five celestial pearl danios. I have not seen babies in a long time. They hide most of the time. I only saw them because I was sitting on the floor waiting for the tank next to theirs to fill. They come out of hiding when they think they are alone! On 12/10/16, I saw six celestial pearl danios. They only come out when I am sitting on the floor which I do while the 50 gallon tank is filling with water after a water change. I otherwise almost never see them! They were playing follow the leader. By 3/20/19, I have come to realize that I have not seen a single celestial pearl danio among the dense java moss in at least 6 months. It is highly likely that they have all passed away. The tank is so heavily planted that I do not know for sure unless I do a 100% cleaning which I have not done since 2001 according to my records. Danio margaritatus is the scientific name for the celestial pearl danio. I have not written anything yet. I have not researched this yet but I have looked at my three celestial pearl danios. Two of them are more intensely colored while the third is duller, slightly larger and fatter. So, it seems that the usual sexing method for danios can be used. Males are slightly smaller, slimmer, and more brightly colored compared to females. Males will also fin display with each other (side by side, tail to nose shimmying). Males will chase females. By 11/16/12, I am sure that my surviving two danios are a pair. As is typical for similar species, the male is more intense in color; the female is larger (more fat in the tummy); and the male chases the female almost daily. By 7/6/13, the pair had at least seven adult-sized babies. My pair of celestial pearl danios showed typical danio behavior with the male chasing the female. 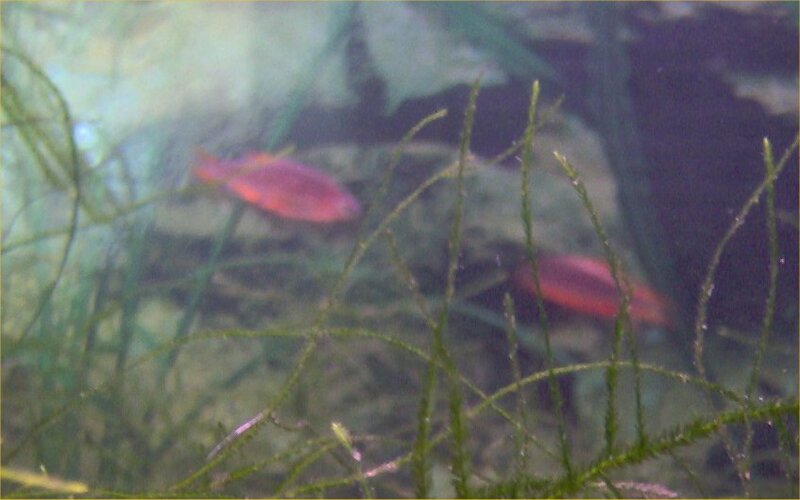 I did not witness spawning (in the dense plants) but did find two fry in the water drained for a cleaning on 11/24/12. They then bred regularly. Four celestial pearl danios in drip acclimation on 5/23/12. Video of the celestial pearl danios around 5/24/12. At the beginning of the video, there is a not-to-bad view of one of the danios. Then, the camera kind of goes wild (I was shooting blind as the camera screen was all white). You can also see some of my longfin panda cories. Celestial pearl danios on 10/18/12. The female is on the left; the male is on the right. My camera refuses to focus on them. This is the best of a dozen photos. Celestial pearl danios on 1/23/13. I have marked the male, female, and one baby. There are five babies in there right now. This is the best photo of about 10 shots! I tried to get some good photos on 9/14/13 but without much luck! It is a shame that such beautiful fish are just impossible to photograph. They are too small and too fast. Two celestial pearl danios to the right of the pleco. Two celestial pearl danios - close-up of previous photo. Check out this celestial pearl danio web site which includes a forum if you have questions.